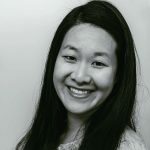 Published Aug 28, 2016 By Julia 4 CommentsThis post may contain affiliate links. 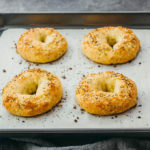 Note: This is one of my older recipes and is not low carb. 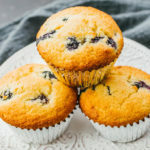 Visit my Recipes page for low carb and keto recipes. Here’s a delicious 15-minute pesto pasta salad to bring to your next event. 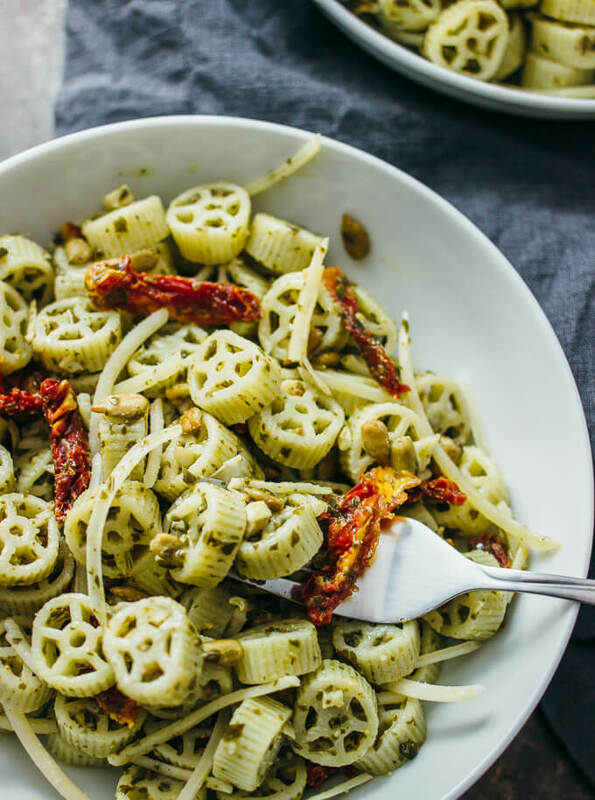 It’s easy to throw together with only 5 ingredients in this recipe: pasta, pesto, sun-dried tomatoes, parmesan cheese, and sunflower seeds. 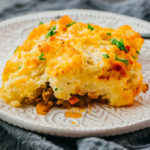 And it’s a cold dish, so it’s great to bring to summer potlucks! 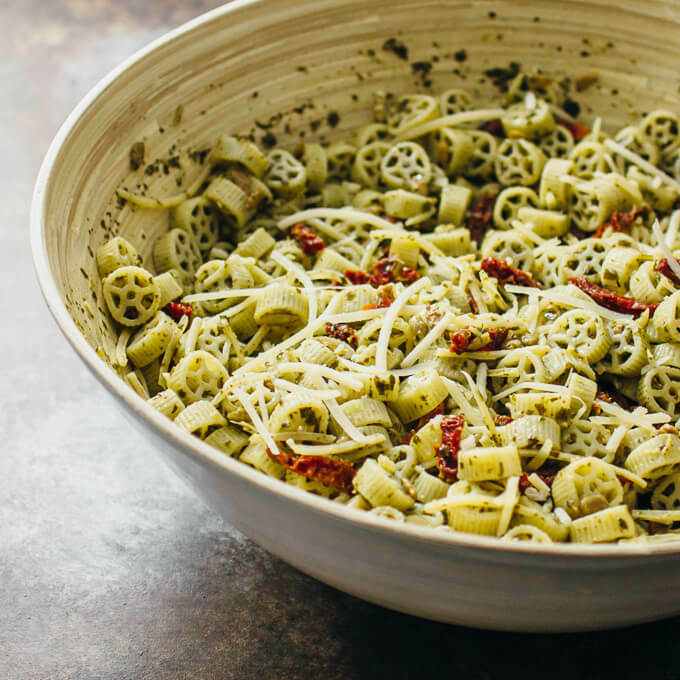 This pesto pasta salad is one of my favorite dishes to bring to a summer party when I’m looking for (1) easy and fast, (2) cold dish for a hot day, (3) easily transportable, (4) can be made ahead of time, and (5) crowd-pleasing. I made this pasta salad for a book club yesterday when it was 94 degrees here in Boston and the hostess had no A/C at her place. It was very hot and muggy, but we had prepared for it, so we had a nice spread of cold food: this pesto pasta salad, cold Japanese soba noodles, pink lemonade, and a peach dessert with ice cream. To prepare this dish, start off by cooking your favorite pasta. Get either wagon wheels (if you’re feeling fun) or bowtie (if you’re feeling boring ?). I haven’t had wagon wheel pasta in forever, so I opted for that choice. I love the look of those mini wheels and they’re easy to stab a fork with. 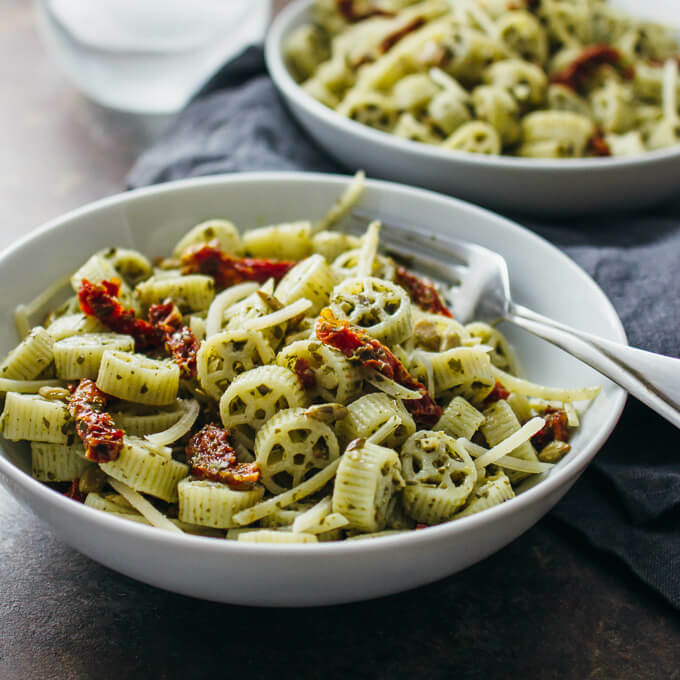 After the cooked pasta is cool, mix it with pesto, sun-dried tomatoes, parmesan cheese, and sunflower seeds. And that’s it! Easy, right? You have a couple of options for the pesto. You can find basil pesto in the cold case at the grocery store, and they are also sold in jars. Even better if you’ve made your own pesto earlier this summer and it’s sitting in the freezer, just waiting to be used. 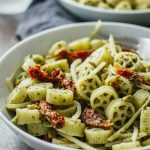 If you don’t already have pesto and want to make your own, you should definitely try my broccoli pesto recipe! 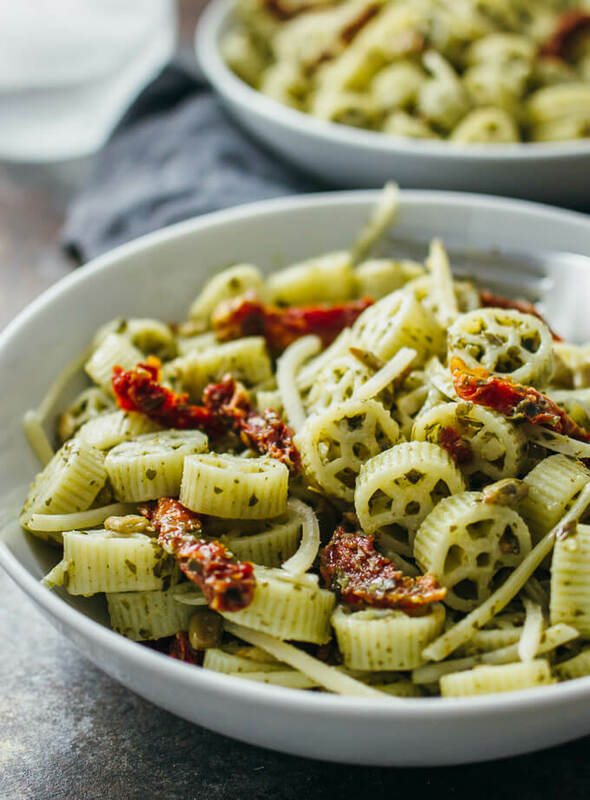 It’s a little different from the typical basil pesto and I love it. Cook pasta according to package instructions. Drain in a colander and rinse for a few minutes under cold water until the pasta cools. In a large mixing bowl, combine all of the ingredients. Toss. Refrigerate until ready to serve. A point of pesto sauce? A 16 oz jar or what? I am confused!! I meant to say a pound of pesto…sorry! Yes, a pound is equal to 16 ounces. Depending on what your local store sells, it may come in 8 ounce jars so you’ll need two of them.